McCall understands that the individual between 'the snakelike creatures' may be Dumuzi (the biblical Tammuz of Ezekiel 8:14, whom Jewish women mourned in the Jerusalem Temple ). Are coming on the boats. They carry wood to bind the neck. Husband of Inanna, son of Sirtur, brother of Geshtinanna! Rise from your false sleep! Your ewes are seized! Your lambs are siezed! Your goats are seized! Your kids are seized! Take off your me-garment from your body! Naked, you go with us!" "They [the demons] held on fast to holy Inanna and stricken with terror she gave Dumuzi into the power of the devils. They said, ' This boy, put fetters on his feet, truss him up, pinon his neck in stocks...they pinioned that boy by the arms..."
Also of interest is that Sandar's rendering mentions that Dumuzi was transformed into a snake by the sun-god Utu, enabling him to escape for the moment from the demons who had bound him. The snakes on the seal, however suggest to me that they are the demons. Note: The seal does NOT follow in detail the above hymn exactly. There may have been different portrayals of the events of the binding of Dumuzi, or the artist may have simply taken "liberties" with the iconic portrayal. For example, Dumuzi is shown only half-naked, his upper torso having no clothes as he enters the gate to the Underworld. This iconographic portrayal does, however, agree with the myth called the "Descent of Inanna into the Underworld." 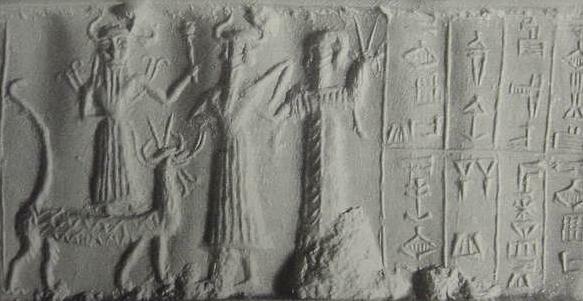 Inanna was Dumzui's bride, and she has him taken to Hell to be her surrogate so she can be released from the Underworld. In the Inanna myth she surrenders various peices of clothing at each of Hell's seven gates until she appears completely naked when presented to her sister who is Hell's ruler. So, Dumuzi's partial nakedness at Hell's gate in the seal may be reflecting aspects of the Descent into Hell by his bride Inanna. Upon Inanna's release from Hell, all her clothing was restored her as she passed back through the various gates. Of interest in the seal is that the last image (4) shows Dumuzi fully clothed again, possessing crown, clothing and sceptre (the branches being a "type" of sceptre ?) as in scene (1) when he was bound, which suggests for me his release from Hell and restoration of his clothes to him as occured for Inanna when she returned to the earth's surface. The Mushhshshu serpent-dragon Dumuzi stands on was, according to Professor Stephen H. Langdon, an aspect of Ningishzida, who was considered a Vegetation deity like Dumuzi, the name Ningishzida being understood to mean "Lord of the Good Tree," so perhaps the two branches with fruit (his "new" sceptre?) held by Dumuzi allude to the serpent-dragon as a Tree-deity or even an animal manifestation of both Ningishzida and Dumuzi? I understand that certain motifs associated with Dumuzi/Tammuz and his companion Ningishzida came to be assimilated to Jesus Christ in New Testament times, being fused with additional resurrection motifs from the Greek 'god of the Vine' (wine), Dionysus. Could the "branch" held to the nose of certain reprobate Jewish priests/worshippers in Ezekiel's vision (Ezek 8:17) be alluding to the two branches being held by the god Dumuzi/Tammuz who stands on the Serpent-dragon in the below seal ? That is to say the Tammuzi/Dumuzi cult was introduced to Jerusalem by some Jewish priests by Exilic times and perhaps some of these concepts came to be fused to the Messiah-Christ by some heretical Jewish groups by Christian times? Dumuzi's branch, which symbolizes him as the Spring vegetation may have come to be reinterpreted as the Davidic "branch" associated with the Messiah (Jer 23:5) ? Christ is portrayed as a bridegroom who _willingly_ lays down his life in the Spring as a surrogate in Hell for his "bride" the Church, whereas Dumuzi also called in hymns "the bridegroom," is an _unwilling_ surrogate for his bride, Inanna. Inanna was three days and nights in the underworld before being released and the same period holds for Christ. Dumuzi is allowed a resurrection from Hell in the Spring for six months each year because his sister Geshtinanna was _willing_ to become his surrogate for him rather like Christ. Christ is called the "True Vine," and Geshtinanna means "Lady of the Vinestock or Grape-vine." Jeremy Black & Anthony Green. Gods, Demons and Symbols of Ancient Mesopotamia, An Illustrated Dictionary. London. British Museum Press, in co-operation with University of Texas Press, Austin. 1992. Samuel Noah Kramer. Sumerian Mythology: A Study of Spiritual and Literary Achievement in the Third Millennium B. C. [Revised edition]. Philadelphia. University of Pennsylvania Press. 1961. 1972. reprint 1997. ISBN 0-8122-1047-6. Stephen Herbert Langdon. The Mythology of All Races, Semitic. Vol. 5. Marshall Jones Company. Boston. 1931. Gwendolyn Leick. A Dictionary of Ancient Near Eastern Mythology. London. Routledge. 1991, 1996, 1997. Henrietta McCall. Mesopotamian Myths. London. British Museum Press, in co-operation with University of Texas Press, Austin. 1990, 1993. N. K. Sandars. Poems of Heaven and Hell from Ancient Mesopotamia. London. Penguin Books. 1971.